Here is my take on a Sweet Potato Casserole that is NOT a crossover (for us Trim Healthy Mama’s). I made a Pre-Thanksgiving meal for dinner last night and the two things I had to have on the menu were Squash Casserole and Sweet “Potato” Casserole. I knew that having actual Sweet Potatoes would make it more of a crossover because I was NOT going to skimp on the butter for this dish! Then I had a BRILLIANT idea… PUMPKIN!! Pumpkin is an FP squash so this would work! SO needless to say, this is really yummy! I used the THM Gentle Sweet as my sweetener (and it’s my sweetener of choice)… I literally could have eaten the butter-walnut topping in a bowl by it’s self because of this sweetener! Go buy some… here is my THM affiliate link to purchase the sweetener <<HERE>>. This is an S to enjoy with other S dishes! Enjoy! 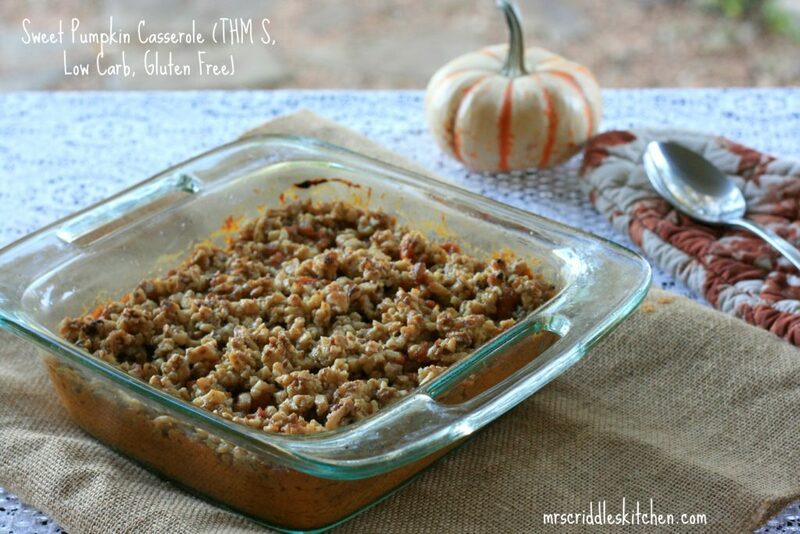 My take on a sugar free gluten free Sweet Potato Casserole that will keep you on the THM plan! In a bowl mix all the pumpkin ingredients until well combined. Butter your baking dish well. Place the Pumpkin mixture into the 2 quart baking dish. Mix up the topping ingredients. Sprinkle over the top of the pumpkin mixture. 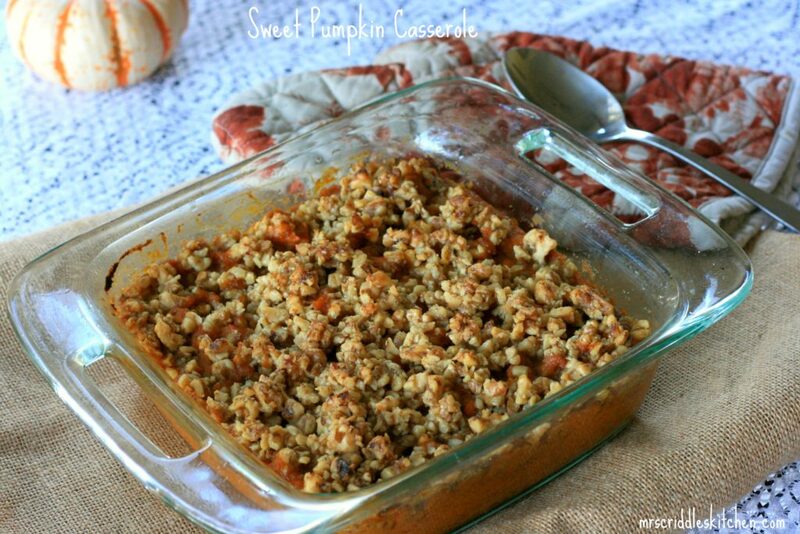 Thanks for this… Been trying to figure out how to adjust my sweet potato casserole and you just did it all for me! Of the sweeteners listed ( I have most all of them) which one is your preferred for this recipe? Well… never mind the question, LOL. I just went back and read your post more closely. I love the Gentle Sweet as well. Thanks again for the recipe! Just a note on the recipe: You say in step 2 to put the pumpkin in the dish and then step 3 is to butter the dish. 😉 Might want to remove the first one. This looks awesome and yummy, can’t wait to try it- thanks! Thank you, I will look at that!! Yes! I make the sugar version every year. Excited to try this! Please….make a cookbook and put your recipes in one spot!!!! Would so love that…. I made this last night. It is wonderful! Thank you. Do you melt the butter for the topping or just mix it up with something like a pastry cutter? Is the butter for the topping supposed to be melted before combining with the other topping ingredients? I had it at room temp so I could mix it together. We had this for Thanksgiving. It was AWESOME! It would be great if you could make a list of crossover meals, like you did with the breakfasts, lunches, etc. I’m pregnant, and trying to figure out what to do for crossovers, and when to eat them. Your recipe looks wonderful! If I made this with canned yams instead, it would make a crossover, wouldn’t it? My mom doesn’t care for pumpkin, but loves sweet potato. Thanks! Your recipes are so awesome! I’m so confused by sweetners. If I am using Pyure, how much would I use? Thank you for posting this recipe. I made it last night, but was late and could not try it. Had for breakfast this morning and it was amazing. My new favorite!! The ratios are perfect. God bless and continue to post more recipes for all(me) to enjoy. I could cry right now. 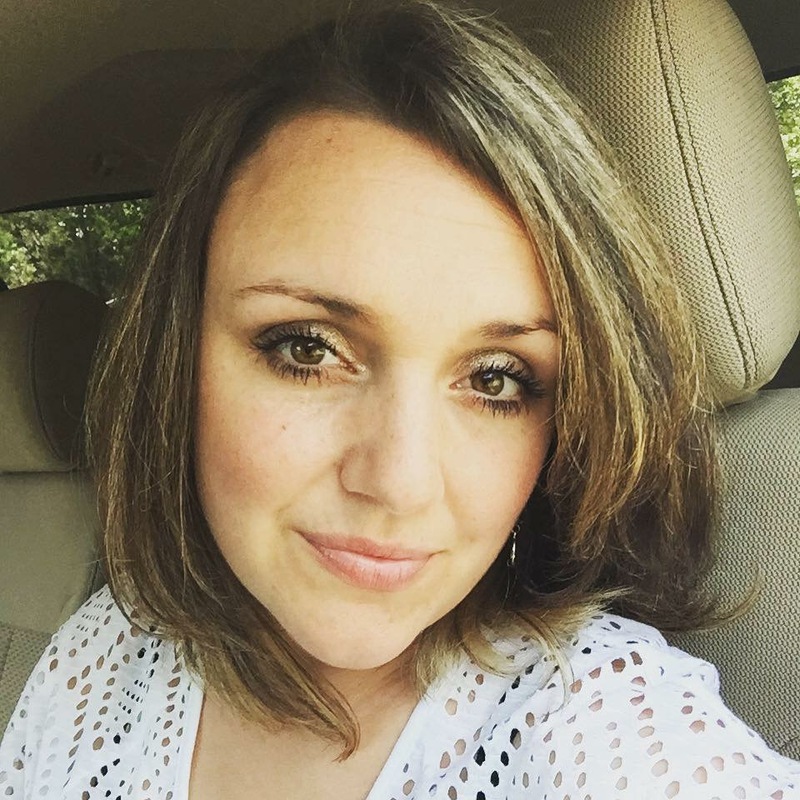 I have felt so much better eating a low carb lifestyle and for that I am truly grateful. 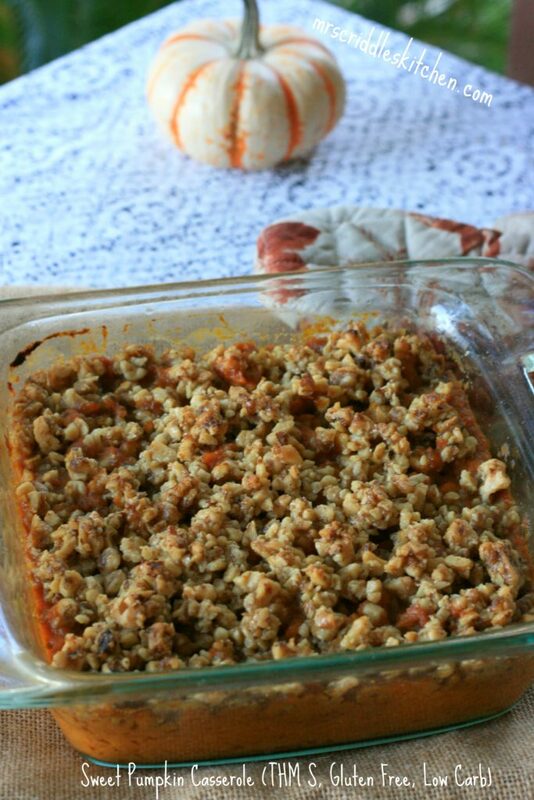 That being said, my favorite food in the world was sweet potato casserole. Thank you for your recipe. This is in the oven right now and already smells divine. Thank you for your hard work and for this recipe. I am sooooooo excited to have this! Can’t wait to check out the rest of your website now! Blessings to you! Hugs!! I hope you enjoyed this!! It was so yummy for us!! Am I the only one who’s casserole turned out runny? It tastes AH-mazing but was like soup. Should I add some coconut flour to thicken? Or reduce the butter? Thank you for this recipe! I want to make it again, just a little thicker. Hm, I’m not sure what happened. Maybe reduce the butter… did you use canned or fresh pumpkin? You could use coconut cream and thicken it up with a little sweetener! We really liked this a lot! Thank you for sharing! No… I haven’t… but I think it would work!! Going to make this for Thanksgiving 2017! Thanks!!! How much stevia would I use? Yes but I am not sure about the conversion or the taste. I would say start with a 1/4 of teaspoon for the batter part and then add a little more at a time. Same with the topping. Sarah….this. Is. Delicious! THANK YOU! 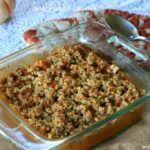 Years ago I made a sweet potato casserole covered in a sugary pecan crumble (so fattening and terrible but oh so good) and I was wanting to make something similar Thanksgiving this year. This hit the spot! It was perfect. 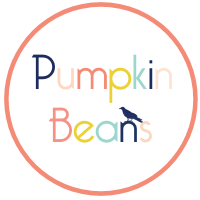 I am new to THM and I have tried so many of your recipes–all delicious, you are amazing! For the entire recipe, How many carbs roughly? I’m not 100% on the carb count..
Could I add some almond or coconut flour to the topping and still be on plan? I appreciate all your recipes. I’m going through them pretty quickly. Sure… it does have a topping though. I tried the topping with the ingredients you had listed, but it just looked like wet pecans since there was nothing to hold them together except gentle sweet and butter. I’m not sure how you got such a gorgeous looking topping photo with ingredients listed. I reread the ingredients several times but I don’t see anything to fill out the gaps between the nuts. Still delicious though. Yes that’s right… it’s more of a crunchy nut topping. You could add about 1/4 cup of almond flour with a tbsp. of egg white to help bind it if you’d like. Could I mix it this up and wait to bake it later, like the next day? I’m sure this is way too late but yes, you can!